내가 가야 할 곳은...: ALL03 USB adapter D.I.Y. 사용 할 수가 없어 한쪽 구석에 쳐박혀 있었다. 웹 서핑중 우연히 이 ALL03에 대한 내부 회로도와 간단한 테스트가 가능한 소스를 구할 수가 있어서 여기에 TUSB3210 USB 슬레이브 컨트롤러를 달아 USB인터페이스가 가능하도록 해봤다. 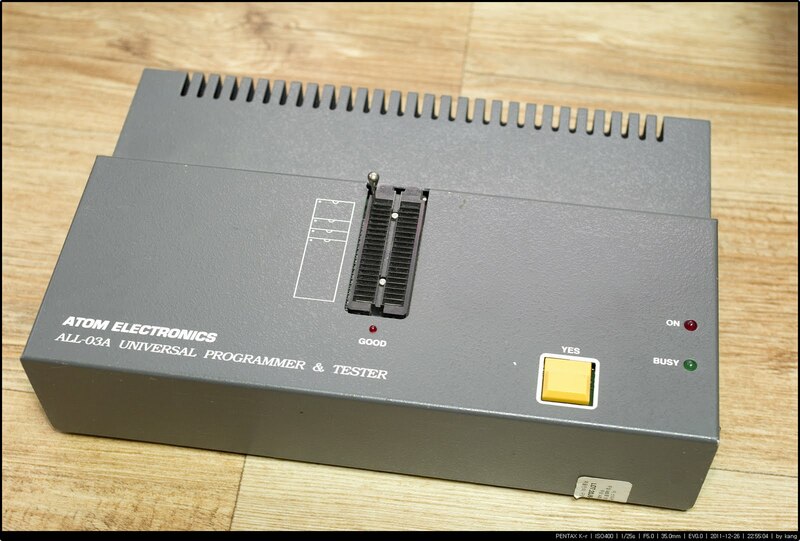 I have an ALL03 universal programmer that has only legacy ISA interface. So it can not be used with recent PC environment. But, I'v found schematics, diagrams and test program sources from Matthieu Benoit's home page, and I started to develop USB interface adapter for ALL03 universal programmer with this helpful information. I'll use the name of 'ALL03 USB adapter' for my project. You may can get useful information from below link (Matthieu Benoit's blog). The TI's USB client controller TUSB3210 is used for this project. 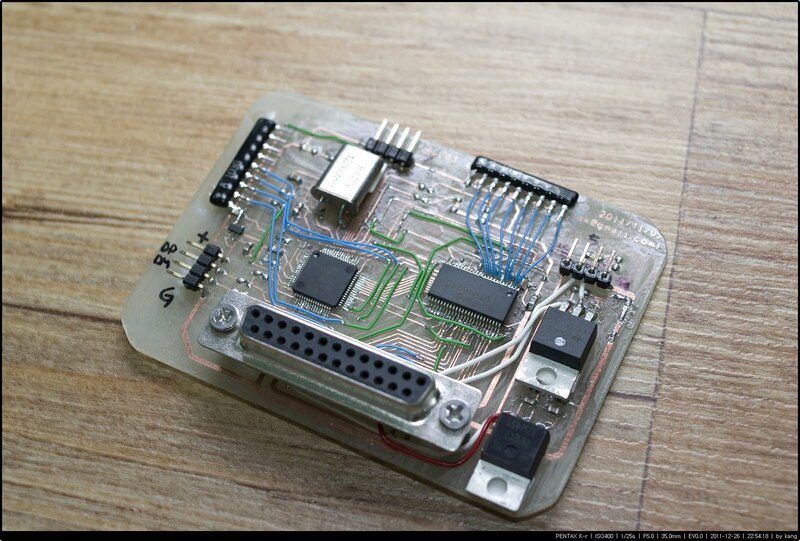 It has on-die 8051 controller with USB engine so you can program your own USB client. Your 8051 firmware can be downloaded through USB connection or can be stored at external serial-EEPROM. 우선 TUSB3210과 3.3V-5V인터페이스가 가능한 버퍼를 이용해 회로를 꾸민다. The first of all is designing schematics. ALL03 프로그래머는 +-12V와 5V전원이 필요해 외부에 +-15V, 5V 출력이 가능한 DC전원을 달아 줬다. 하드웨어가 준비 되었으니 이제 다음 삽질, 코딩 작업이 남았다. 마지막으로 어플리케이션을 만들면 된다. 참 쉽죠?.. 우선 32KB짜리 SRAM을 read/write 테스트 할 수 있는 간단한 코드 부터 시작 했다. 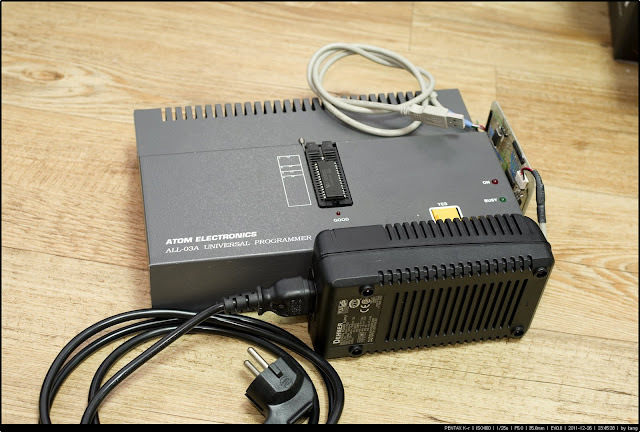 I attached +-15VDC, +5VDC output power supply because the All03 universal programmer needs +-12VDC and 5VDC power (My ALL03 USB adapter has +-12VDC regulator). The ALL03 assessing is composed of one to four or five bytes read/write, so the access speed is slower then ISA interface because the USB transaction has lots of overhead for handshaking (USB communication is good for bulk data transfers). 진행 하지 못해 문서는 제외하고 배포합니다. 내용 업데이트 및 문서화가 진행되면 아래 링크도 같이 업데이트 됩니다. I published schematics, device driver and test application source for Windows XP OS. But my ALL03 USB adapter card is under-development, so my program has no device programming capability and it might has software bugs. I'll update my software continuously. 배포하는 회로도 및 소스/바이너리 파일들은 아직 버그가 많이 있을 수 있습니다.